30 month time limit - A national phase application must be submitted within 30 months of the PCT priority date. A two month extension is possible, conditional upon payment of additional fees. Chinese translation - A Chinese translation of the application must be submitted at the time of filing (i.e. up to 32 months after priority date with above mentioned extension). This also applies when filing amendments. Substantive Examination deadline - The deadline for submitting a request for substantive examination for a patent is 3 years from the priority date. The examination will be carried out by the examiners of the SIPO, who will decide whether or not the claimed invention should be patented. An examination will check whether the application fulfills the requirements prescribed by law, i.e., whether or not there are any reasons for refusal. A Substantive Examination is only carried out by the SIPO when requested by the applicant and involves an additional fee. How can I make sure the SIPO will approve my patent? Based on a technical idea which uses a law of nature. Inventions contravening public order and good morality, or inventions not in the best interests of the public. Method of surgery, treatment and examination of human beings. Animal or plant species (methods for manufacturing products composed of these are patentable). Material Produced by means of nuclear transmutation. Intellectual activity involves human processing of, or response to, information and does not utilize technology or laws of nature. Accordingly, it cannot be considered to have the technological characteristics necessary to qualify for patent. Business models fall into this category of non-patentable invention. If your application is refused you are entitled to respond with an argument or amendments that are within the scope of the specifications submitted in the International Application. For PCT based applications, this allows a chance to correct errors that occurred because of the translation process. If the reasons for refusing to grant a patent cannot be resolved, even after it been appealed, a Decision of Refusal will be issued. It is possible, however, to request a re-examination. If there are no reasons for your application to be refused, you will be granted a patent. Patents have a lifetime of 20 years after which they expire. Provided the fees are paid within two months of receiving notice that the application has been successful, the patent will be officially registered and assigned a patent number. 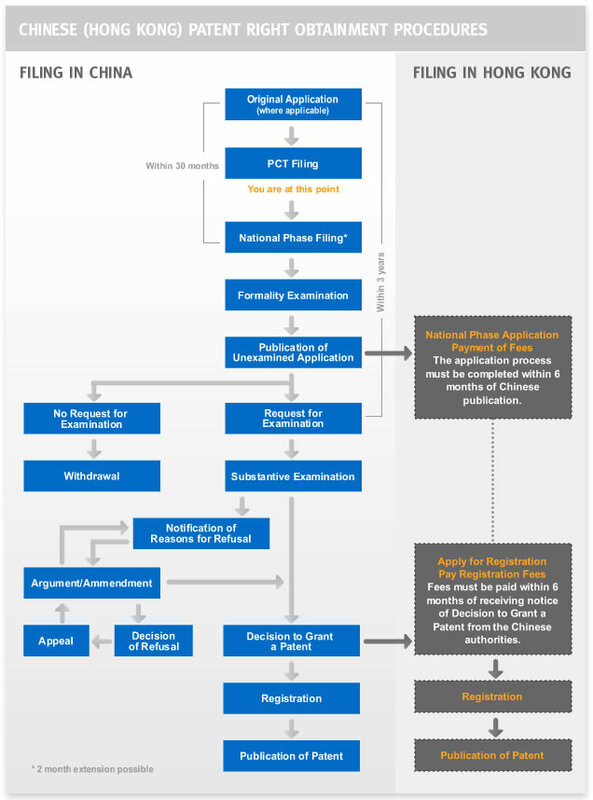 It is possible to file in Hong Kong, without going through a separate examination, if an application is filed 6 months after issuance of the unexamined patent application. Filing in Hong Kong based on a Chinese application also creates the advantage that a standard 20 year patent can be applied for (if you directly file in Hong Kong, without going through China or the UK first, you may only apply for an 8 year patent).